A similar message was shared at Drumheller Prison yesterday that God uses nobodies for His purposes, and works through our weaknesses, not our strength in the flesh, because no flesh glories in His presence. We are most useful to God when we deny self, and trust in Christ alone. The inmates responded to the word of God, and came forward for prayer at the end. Street Church witnessed a knife fight Friday night, one man responded to the gospel, and on Sunday many came forward and responded to Jesus under the bridge in the pouring rain. Praise God. We check with our “Christian lawyers” on how we should deal with certain situations, and sometimes compromise the truth in fear of getting sued; we now call evangelism being good to those around us, and hopefully Jesus will rub off on the lost, or they will ask the question can I have what you have? When the Bible is clear that souls are saved by the foolishness of the preaching. We are to preach in word and deed, but now the word part seems to have been taken out of our witness, and we are suppose to be good people, and that has now become the gospel of the church, our own good works, how good of people we are because we swear less, feed and house the poor. I do not know about you, but I want to point people to Jesus, because He is the only one who saves, not me, the church, or a Christian organization. Jesus said only what you do in my name will last. We at times have become no better then a rotary club, doing all these good works, but leaving out the very Person who brings Life, Jesus Christ. Then when the gospel is being preached openly, unashamed, these preachers are called unloving, and harassing people with the gospel, Even when hundreds are getting saved. How far we have come from the truth of biblical evangelism. Woe are we when we are esteemed by men, and well liked by all. John Wesley said when he preached he seeked only 2 responses, men getting saved, or men hating him. Riot or Revival. We pray for revival, but are we ready for riot or true revival in our churches. Are we ready to be treated like the following men of God, who sacrificed all for the sake of the Gospel. Who were constantly ridiculed, lied about, thrown in prison, beat, and killed for the gospel. Has satan changed his tactics in North America, or are we so luke warm we are no longer a threat to his kingdom? As I look at the Jesus, the apostles, and men of God like William Booth, John Wesley, John Wycliff, the persecuted church in the world today, they were, and are not esteemed by men, but they are and were esteemed highly by God. I have met with boards of different Christian organization’s who say they cannot preach the gospel openly or do what the Holy Spirit tells them, because then it may offend some of their donors, certain members on the board, and government and corporations who give money. Jesus said we cannot serve God and mammon; you will love one and hate the other. With the Shekels come the Shackles, and we are seeing a trend among our North American church which is selling out to money, pleasing men, fear of getting sued, lose tax receipt status, and justifying it all by our good works. We are compromising the gospel, and we wonder why we lack power in our church, and why many of our youth are leaving the church, and why hardly anyone shows up for evangelism or prayer nights, but the social nights are full, and we settle for that by saying to ourselves, as long as people are coming to church, were good. When the gospel becomes secondary, and we are afraid to speak the name of Jesus in public, out of fear of rejection, or money being withdrawn from our pockets, or being called a mad man/fool for Jesus, and then justify our stance by pointing to our buildings, and numbers of people, we have truly missed it, and have become like the verse above, an abomination to God. Many people point to Jesus and say that all men liked Him, but the Pharisees. The Bible says that He was despised by all men Isaiah 53, and that when the crowds got big, and people wanted to follow Him just for the miracles, or getting fed, Jesus would raise the standard by saying stuff like, “You must Eat my flesh and drink My blood, count the cost, let the dead bury the dead, go sell everything you have, you must hate mother and father compared to Me. Jesus would make statements like these and then ask His close disciples will you leave me to? As Jesus was whipped and crucified He had no one stand up for Him, because all of them and us put Him on the cross, because of our wickedness. Then some point to the book of Acts and say the early church was favored by all men, but as you look at scripture, that was only true for a brief period of time and then persecution hit the church, and James was killed with the sword, then Peter was thrown in prison, then all the apostles, except John were killed by authorities for the gospel, then Nero slaughtered everyl Christian he could get his hands on for fun. This is our Christian heritage. The blood of the martyrs is the seed of the church. So the question is why are we, the North American church immune to this type of persecution? That we can live in bliss, get along with everyone, have the world love us for our good works; that we can have no one say bad things about us, no persecution, etc, maybe it is because we are failing, and are no longer being the salt in the earth, and a light unto the world, by compromising the gospel of Jesus Christ, and being ashamed about proclaiming His name, out of fear. Jesus said they hated Me, they will hate you for my sake. ← Harvest is ripe and ready! 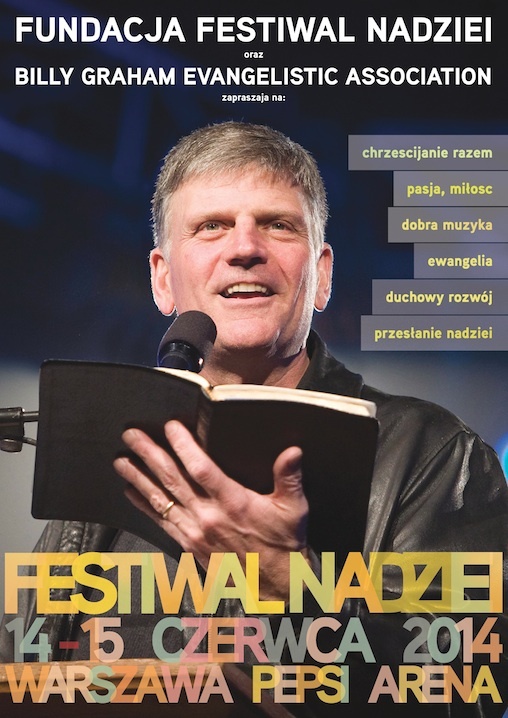 Artur Pawlowski, Franklin Graham and Michael W. Smith are joining forces in Warsaw for the biggest evangelistic crusade in the history of modern Poland. May 10, 2014 Artur Pawlowski Comments Off on Artur Pawlowski, Franklin Graham and Michael W. Smith are joining forces in Warsaw for the biggest evangelistic crusade in the history of modern Poland.